A version of this article was originally published July 23, 2018 on Greentech Media. As the U.S. renewable energy market continues growing and our energy system shifts to cleaner sources, the way clean power is transmitted to our communities must follow the same responsible siting as the energy projects themselves. Wilderness-quality lands, important wildlife habitat, and cultural resources areas are not appropriate for transmission lines and energy development. Thankfully, an ongoing process shows how we can build regional transmission projects crucial to a clean, reliable, affordable energy future without sacrificing environmental stewardship. Smart infrastructure development is good for business — it makes permitting more efficient and increases economic benefits by focusing construction where the least amount of conflict exists and projects are most likely to succeed. 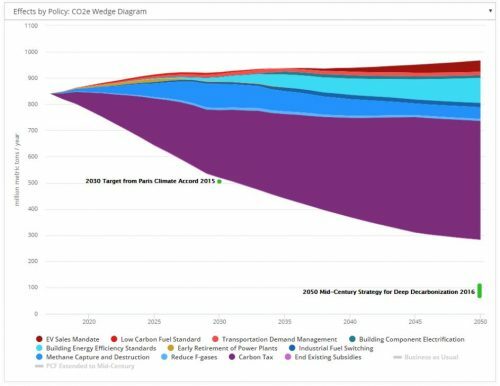 This realization has become apparent over the last few years with the re-evaluation of the federal West-wide Energy Corridors planning process for 6,000 miles of transmission and pipeline corridors spanning public lands in 11 Western states. The planning process identifies continuous strips of federal land across jurisdictional boundaries suitable for transmission and pipeline development. Robust stakeholder engagement minimizes environmental, cultural and other stakeholder conflicts. Eventually, this will streamline federal siting, review and permitting processes for transmission developers, though there is no guarantee of similar success with private landowners crucial to completing many of the corridors. These corridor re-evaluations are a rare bright spot for infrastructure on public lands, quite in contrast to recent federal actions to encourage fossil fuel development and production. Initially designated by the Bureau of Land Management (BLM), U.S. Forest Service (USFS), and Department of Energy (DOE) in 2009 (henceforth referred to collectively as “the Agencies”), the corridors are currently undergoing expansive stakeholder engagement through this review. The Agencies’ efforts to improve corridors by gathering input from local communities, stakeholders, and energy and transmission developers are providing lessons for other regional and interregional transmission proposals. This collaborative effort will be crucial to advance responsible development, while protecting our communities and wild places. Identifying appropriate infrastructure corridors helps facilitate efficient development and protection of public lands. Planning ahead identifies opportunities and potential problems early in the process, providing time to work with stakeholders to find solutions, instead of bogging down projects with unforeseen conflicts and delays while carving up our natural resources with poorly sited development. Criticism of the original 2009 corridor designations included corridors inappropriately sited in areas important for wildlands and wildlife, neglecting critical pathways to areas ripe with renewables potential. After gathering baseline information from Western stakeholders in 2014 and completing internal studies, the Agencies wisely divided the West into regions to be sequentially reviewed, rather than reviewing all 6,000 miles of corridors at once. Regional reviews are being staggered, with the last review to be completed in 2019. After the reviews are completed, the Agencies will change the corridors through future land-use planning, using the reports as a guide. What does effective stakeholder engagement look like? 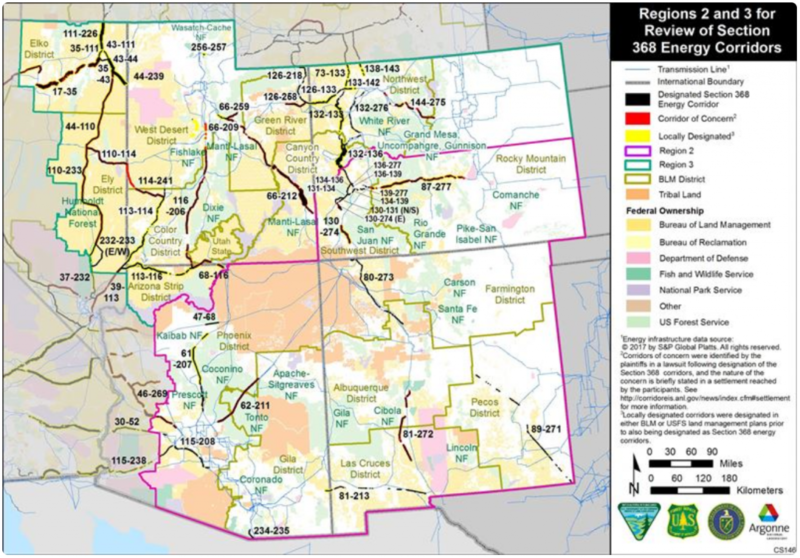 On January 10, 2018, the Agencies published draft “energy corridor abstracts” that detail siting opportunities and challenges for the corridors in Regions 2 and 3, which include 53 energy corridors situated in Arizona, Colorado, Nevada, New Mexico and Utah. 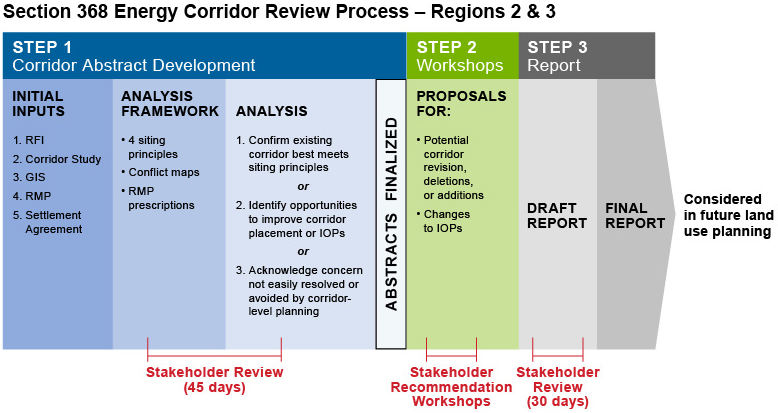 The release initiated a 45-day stakeholder review period, with the Agencies requesting input from the public on the corridor abstracts by February 25, 2018. Comments by The Wilderness Society and conservation partners drew attention to review-process flaws likely to create persistent conflicts with national parks and wilderness quality lands. After analyzing stakeholder comments, the Agencies published revised corridor abstractsin May which include important improvements, such as identifying all locations where corridors intersect with wilderness-quality lands — and in a few cases identifying potential corridor adjustments to reduce impacts. That said, additional improvements are still needed to address these conflicts, and the Agencies should acknowledge their requirement to analyze those conflicts in future land-use planning and authorizations while considering ways to reduce impacts. Without these improvements, the corridors will fail to facilitate efficient and responsible development while continuing to protect the environment. Future project development in corridors will face more conflicts and delays, as well as increased risk of legal challenges — underscoring the importance of following through on a strong approach to the regional reviews. The Agencies also hosted five well-attended public workshops in early June (one in each state) to gather input from developers, non-governmental organizations, and other stakeholders on ways to make the corridors more useful. These workshops dug into the details of tradeoffs for possible corridor adjustments, and provided a wealth of additional information the Agencies can use to inform the Regions 2 and 3 draft report ahead of completing the Regions 2 and 3 review by the end of 2018. The BLM’s other Western regions will follow similar processes through 2019. Each review will generate detailed recommendations from the Agencies for ways to improve corridors through future land-use planning changes by the BLM and the USFS to help facilitate responsible infrastructure development while protecting natural and cultural resources. The Agencies’ public engagement strategy includes many ideal elements for an infrastructure development planning process. It created a clear, step-wise approach that allows stakeholder input throughout the process, including commenting on draft documents, using the project website and its excellent online mapping tool, and attending public workshops and webinars. Through this process, the Agencies are gathering a wealth of information and helping the public understand and participate effectively in the reviews. The Agencies are also improving their methods and approach as they proceed, as well as incorporating stakeholder input into their detailed documents and online mapping tool. However, the Agencies face a significant challenge in the scope of their task and the time frame for completing it. Continued strong investment in agency staff time and resources is crucial for meeting the terms of the settlement agreement and succeeding in the goals of creating a truly useful system of energy corridors. And despite the Agencies’ efforts to engage with project developers, they have not created and communicated sufficient incentives (e.g., clear commitments to more efficient permitting) to encourage developers to site their projects within the corridors instead of in higher-conflict areas. Getting this element right is a crucial aspect of improving the locations of the corridors. While the Agencies are required to re-evaluate all corridors through the regional reviews, a few examples of corridors with major conflicts or opportunities to advance renewable energy development illustrate this effort’s importance. In many cases, simple corridor boundary adjustments would dramatically reduce environmental conflicts while still allowing for development in the remaining portion of the corridor, though some cases will require eliminating a corridor altogether. For example, Arizona-California corridor 30-52 is a crucial pathway for delivering renewable energy and sharing benefits between the two states. This corridor along Interstate 10 could provide a route for the proposed Ten West Link transmission line, and is a much lower-conflict alternative than the route proposed by the developer. That route would cut through the Kofa National Wildlife Refuge, causing serious harm to the wildlife and habitat it was designated to protect. In eastern Nevada, the north-south 232-233 E corridor is a key corridor to address. A nearby corridor follows an existing highway and transmission line, but 232-233 E inexplicably detours through BLM-inventoried lands with wilderness characteristics in a large wildlands complex. In addition to impacting wilderness-quality lands, this corridor also cuts through a BLM Area of Critical Environmental Concern designated to protect the threatened Mojave Desert Tortoise. Through the regional reviews, the Agencies can complete additional corridors analyses that will help projects like Ten West Link use lower-conflict pathways and gain permitting efficiencies, ultimately reducing cost, speeding up development, and increasing the likelihood these lines will materialize. Clear conflicts like Nevada’s 232-233 E corridor designation underscore the importance of regional reviews also recommending changes to reduce wildlands and wildlife habitat impacts. The regional reviews may also identify the need for new corridors through appropriate areas to facilitate renewable energy development. To help meet our nation’s infrastructure needs while protecting our natural and cultural resources, the Agencies should build upon the strong progress they have made to date. They should ensure regional reviews are all completed in 2019 as planned, with continued deep stakeholder engagement. Ultimately, the Agencies must adjust the corridors through land-use plans to create a truly functional system, a goal which is very much in sight. Public engagement has also provided lessons for future transmission planning conducted by different entities in different regions, such as the Eastern U.S. Robust stakeholder engagement including local governments, conservation and other public interest groups, project developers, and utilities is crucial for successful planning. Getting input early and often will provide more opportunities to solve challenging issues and ensure corridors open access to high renewable energy potential areas while minimizing impacts on the cultural, historical, and community resources that weave the East together. Addressing the complex mix of public and private land ownership while gathering information to avoid and minimize conflicts for as many potentially affected lands as possible is important, even if planning entities only have jurisdiction over a subset of lands. Finally, for corridors to be truly useful, meaningful incentives must exist to attract developers to site projects within them, or disincentives must be imposed for siting projects outside of them. Alex Daue is the assistant director of energy and climate at the Wilderness Society.